You’ve probably read their books … Now you can hear these authors read at Cuírt. Bernard MacLaverty is the award-winning author of Midwinter Break, Grace Notes, Cal and winner of the ‘Novel of the Year Award’ for Midwinter Break. 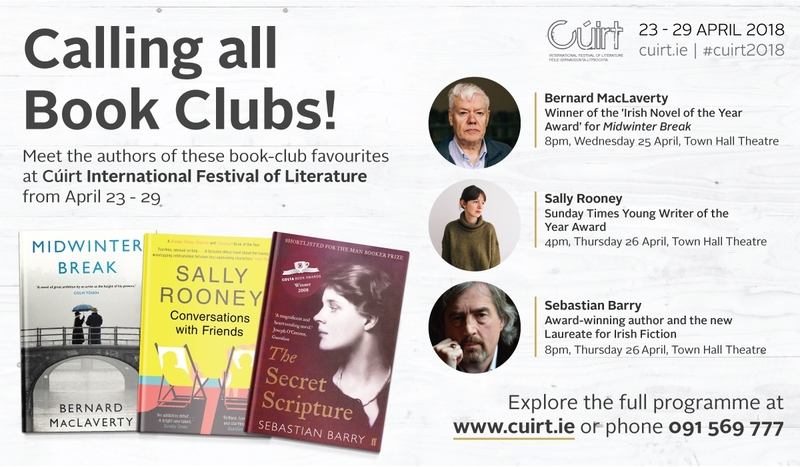 Sebastian Barry is the award-winning author and the new Laureate for Irish Fiction. His novels include The Secret Scripture, Days Without End, A Long Way Home. Sally Rooney’s debut novel, Conversations with Friends, won her the Sunday Times Young Writer of the Year Award in 2017. EXPLORE THE FULL PROGRAMME ONLINE or phone 091 569 777.